Mold is a fungus that depends on the carbohydrate derived from wood and cellulose. Mold needs a moist area to live, where “food” is plentiful. Mold is often found under sinks, especially if water has leaked from a faulty drain. Mold likes to live in the bathroom, and you will often see it between bathroom tiles. It is important to hang towels up to dry after showering to prevent mold and mildew from growing on them. Mold reproduces by creating and releasing spores into the air. Mold spores are airborne, and like pollen can be inhaled into the lungs. Mold can cause allergic diseases, such as allergic asthma and allergic rhinitis, and hypersensitivity pneumonitis. Mold can affect the immune system, and be a secondary cause for a respiratory infection. There are many different kinds of molds that can cause allergic reactions. Alternariais a type of outdoor mold that causes severe allergy symptoms. Alternaria is one of the most common causes of allergic asthma. Mold spores can be carried by dust particles in the air. Even though this is an outdoor mold, it is believed that spores can be carried into the indoor environment fairly easily. 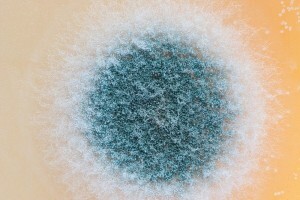 Another common airborne mold found outside is Cladosporium.This type of mold can cause allergic asthma, which is also called “hot tub lung.” Cladosporium mold can be found indoors and outdoors in trash cans, in hot tubs, and in dead, decaying plants. The people most at risk for mold induced allergic asthma are those who are susceptible to hay fever, and already have asthma. The symptoms of asthma caused by the Cladosporium mold are headache, chills, lack of appetite, elevated temperature, and wheezing. A person with a mold induced allergy, such as with Cladosporium mold, could have difficulty in breathing. 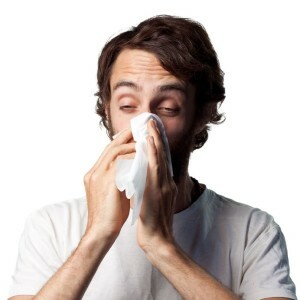 Mold can also cause itchy watery eyes, stuffy nose, and sneezing. Penicillium mold is a common mold found inside the home. It is most often found in musty places, such as in a damp musty basement. Penicillium mold is not as dangerous to the human body as black mold. The symptoms of allergies to Penicillium mold, and other common indoor molds is chronic coughing, sneezing, stuffy nose, runny nose, sinus headaches, difficulty breathing, as well as itchy watery eyes. Different types of molds can cause different symptoms in different people. Yeast, Candida albicans, is another kind of mold that doesn’t grow like other molds. Yeast are single celled organisms that reproduce by budding. The bud grows and eventually breaks away from the cell it was attached to. Other types of mold grow in thread-like clusters and reproduce through sporulation. The mold releases spores into the air where they will find a place to settle and begin to grow. If you are allergic to yeast, you cannot eat foods made with yeast, and you should not drink beer and wine. Yeast normally grows in the body, but it is supposed to be in balance. If yeast gets out of balance in the body, the beneficial bacteria are prevented from multiplying and are crowded out by yeast. Yeast grows in moist areas, such as in the vaginal area in women, and in the groin area in men. Yeast can also grow in the mouth. A yeast allergy is not quite the same as a common yeast infection, but the symptoms are very much the same. The skin where yeast is growing on is very itchy, and can be swelled. There can also be pain the area. Just eating food that contains yeast could induce a terrible yeast infection. The person suffering from a yeast allergy may also feel extreme tiredness, which is caused by the immune system fighting the infection. Just like with mold allergies, a yeast allergy can also manifest as an infection in the lungs. It’s important to avoid all contact with the substances you are allergic to, if possible.